Syrian children, including one who is barefoot, stand atop the muddy ground in the Bab Al Salame camp for internally displaced persons, near the border with Turkey, in Aleppo Governorate. Supporting refugees is a global responsibility that must be widely shared, the UN refugee agency stressed today ahead of a one-day high-level conference it is hosting in Geneva tomorrow, focused on refugees from Syria and the need for generating a substantial increase in resettlement and other answers for their plight. 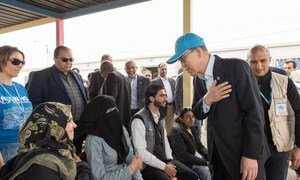 United Nations Secretary-General Ban Ki-moon continued his trip to the Middle East today with a visit to Jordan alongside World Bank President Jim Yong Kim, where they met with refugees from the Zaatari camp, as well as with senior government officials from Palestine, Turkey and Jordan, including King Abdullah II.